As what’s left of OneCoin management either quit or quietly disappear, top investors in the scheme have become a vital source of information for disillusioned affiliates. Eager for any news regarding their investments in limbo, “leaders” like Muhammad Zafar are vital in creating the illusion of stablity. Unfortunately for Zafar one of his primary outlets for Ponzi PR, his YouTube channel, was recently terminated. We’re not sure which of YouTube’s policies Zafar violated. The bulk of content on his channel was OneCoin related however, so make of that what you will. Thus far Zafar hasn’t responded to his account termination. OneCoin’s own YouTube channel was terminated last year. Amusingly the company responded by threatening YouTube with legal action. After the removal of one or more videos, OneCoin did eventually manage to get the account reinstated. Whether Zafar will be able to do the same remains to be seen. 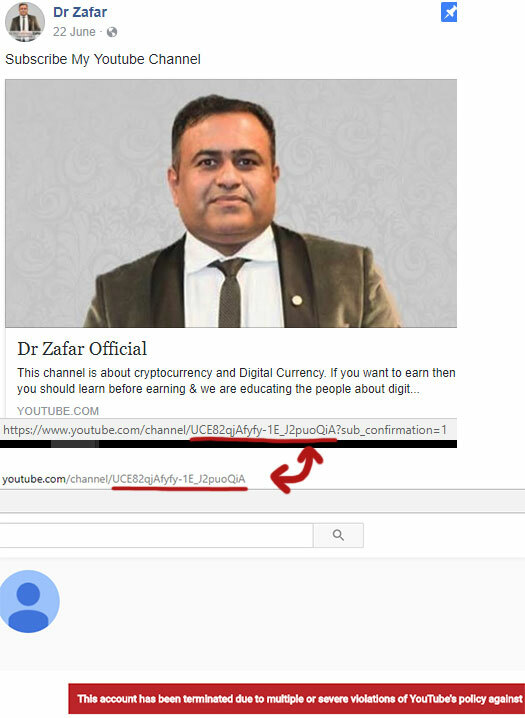 While Zafar can still promote OneCoin on Facebook, the loss of his YouTube channel is no doubt significant. Two months ago Zafar used the channel to reveal OneCoin had dropped their IPO in favor of an ICO. Aside from marking the change in how OneCoin affiliates received news from the company, this announcement also caused mass panic and confusion. To this day that hasn’t been resolved. OneCoin is currently a faceless company, with seemingly nobody willing to front it and face affiliates. Instead news is disseminated through unsigned corporate updates. The latest of which advises affiliates OneCoin has delayed ICO registrations till next year. The shell company Golden Gate Investments has already been dropped in favor of SILO Capital Group, which appears to be another hastily created shell company. It seems there’s no end to the number of shell companies OneCoin can conjure up on a satoshi.